Whether you take this as a recommendation likely depends on your feelings about U2. Jeffers, though a prolific artist and children’s author, doesn’t approach the Irish rock band’s level of overexposure. The kinship is one of nationality, and of sincerity. Jeffers is sincere. He is utterly sincere. And so is his work. 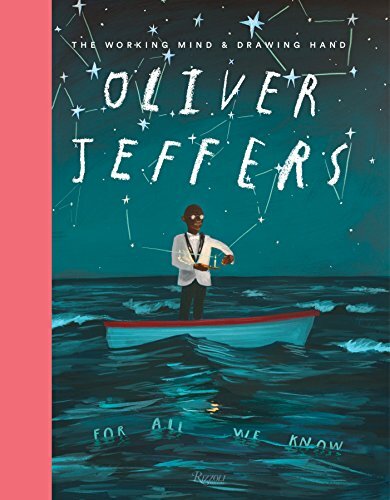 Oliver Jeffers is best known today as a creator and illustrator of children’s books. Author is perhaps going too far: Jeffers is an illustrator who uses words, not a writer who sketches accompaniment to his stories. Including The Working Mind & the Drawing Hand, Jeffers has published 18 books; this is the only one created for an adult audience. His books demonstrate the extent to which children’s books are an art medium. Childless adults with a taste for visual design know Jeffers’ oeuvre. The Day the Crayons Quit sits proudly in the windows of countless independent bookstores (if there remain enough independent bookstores to be countless; one dreams). The Great Paper Caper lends itself to hipster wall art (its lumberjack bear, thief of trees, navigates the forest justice system with aplomb to be studied by aspiring adults). This adult devotion to Jeffers’ work seems to be the origin of The Working Mind. The book has short blocks of text, but it is overwhelmingly visual. A page of text feeds a dozen pages of collaged and overlapping works of art. U2 has much to say on the modern history of Ireland, but Oliver Jeffers says much less. Mayhem is controlled in Jeffers’ work. It’s present, even fighting to break out, but Jeffers contains the madness. His text is largely hand-written, mixing all-caps printing and childish cursive, but his sentences are carefully punctuated and neat. The juvenile handwriting echoes Jeffers’ visual style, which emphasizes childish seriousness. Human figures have scribbled shadows and stick legs. One thinks first of Picasso’s oft-quoted, “It took me four years to paint like Raphael, but a lifetime to paint like a child.” Jeffers isn’t quite that good. His art is the art of an adult imitating childhood, thoughtfully and with deeply-considered aesthetics. Children acknowledge and respect it, but they wouldn’t mistake it for something they have done themselves. The Working Mind goes beyond Jeffers’ children’s books. His gallery artwork fills more than half the volume. Here is Jeffers the Brooklynite, creating in a mode that just exceeds the hipster zeitgeist. He adds cartoonish sketches to found oil paintings: planes sink into serene mountain lakes, cruise ships wreck in sand oceans near travelling Bedouin. Jeffers’ own paintings are complex things that only reveal their intent when a whispering docent provides a psychic history of the project. The “dipped paintings” project, in which Jeffers creates full paintings and then dips them in enamel before small audiences, suffers from conversion to book form. The concept and execution are genuinely wonderful: they identify the frustration of truly lost art in a digital world. Yet the reader doesn’t experience that loss, only its aftermath. Jeffers’ children’s books take their places in the flow of his work. Painting projects and sketchbooks slide into illustration projects without sharp transitions. The result is an art book: an exploration of an artist’s work with an eye to comprehensive coverage. The books themselves exist here only in gestures. A few images persist from each, but the stories don’t make their way through. In the end The Working Mind & the Drawing Hand is a beautiful book for a Jeffers devotee, but it’s not a gate into his world. Explorers need a narrower territory and a more detailed map.